LONDON (Reuters) - A bumper year for Britain's car industry offers some hope the economy will start to grow in a more sustainable way, with a better balance between investment and spending. In 2013, Britain enjoyed its best year of economic growth since the financial crisis, outpacing other advanced nations. But there was a catch. The recovery was driven by consumers spending more and saving less. A smooth transition to longer-lasting growth, propelled by business investment and exports, is a key hurdle for 2014 according to the Bank of England. The car industry is showing signs of leading the way - but there have been false starts before. Every year since 2010, Britain's budget watchdog has predicted a rebound in annual business investment - but it is still a third lower than before the financial crisis of 2007-2009. It is essential for Britain's recovery. "The pace of investment - when it comes - will ultimately determine the duration of the current upswing," BoE policymaker Ian McCafferty said in a speech to businesses last week, adding that many firms were operating close to capacity. A string of surveys show firms are more willing to pump money into their businesses than at any time since the crisis - in the services sector as well as manufacturing. Rebalancing is often talked about in terms of moving the economy towards manufacturing and away from services. But what the BoE wants is a shift in spending towards investment and away from consumption, rather than between economic sectors. Other positive signs include a growing appetite among banks to lend. And Britain's stronger economic outlook should encourage firms to invest their large cash reserves. But, for now, official data on firms increasing investment is thin on the ground. The exception is the car industry - which benefited from an upturn in demand well before other sectors and saw more than 2.5 billion pounds ($4.16 billion) of new investment in 2013. Britons bought 2.265 million new cars in 2013, the highest number since 2007 and an 11 percent rise on the year that bucked the trend in Germany, where car sales fell 4 percent, and France, where they dropped by 9 percent. One big factor in Britain was probably compensation payments by banks to consumers for mis-sold insurance which were often big enough to be used as a deposit on a new car. Cheap finance deals and record-low rates helped fund the rest. It helped drive Britain to produce 1.510 million cars in 2013, the highest number since 2007, according to the Society of Motor Manufacturers and Traders. Britain is a hub for automakers including Nissan, Toyota, Honda, BMW, General Motors and Tata Group's Jaguar Land Rover. German parts maker ElringKlinger has invested 10 million pounds in a new plant in Redcar, northeastern England, to make the light-but-bulky heat shields that protect cars from hot exhaust gases. These will be fitted to BMW Minis built in Oxford, replacing parts made elsewhere in Europe. The investment was only feasible thanks to strong domestic demand, said Ian Malcolm, ElringKlinger's UK managing director. 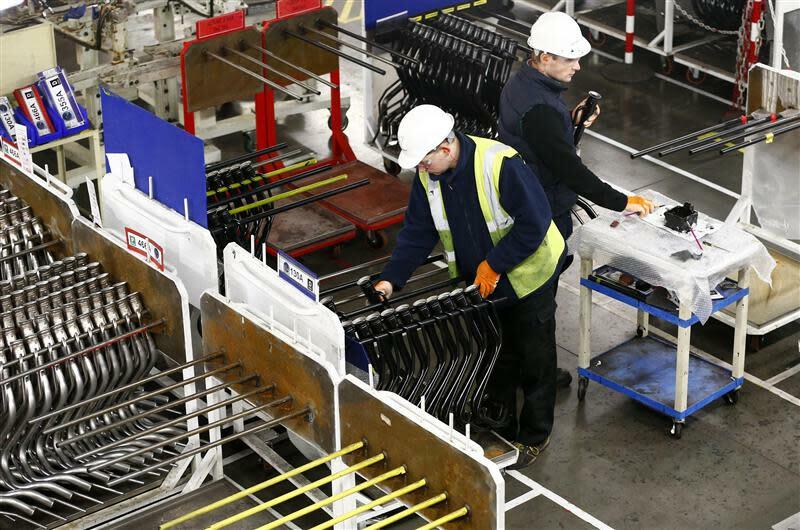 "The growth in vehicle production in the UK is of much greater significance to us, because the product we are starting to supply is much more difficult to ship halfway around the world," he said. There are some tentative signs that the growth in automotive investment is being replicated more broadly. Manufacturers plan the biggest increase in investment in 2014 since the start of the financial crisis, surveys show, much of it to replace older equipment. Companies in the services sector showed the strongest intentions to invest since 2000, according to one survey. And Britain's economic turnaround means shareholders are more willing for firms to spend their precautionary cash piles, said Ian Stewart, chief economist at accountants Deloitte. But it is too early to tell if this is just cyclical or marks the start of a longer-term approach to investment. Samuel Tombs, UK economist at Capital Economics, said he expected the rebound in investment to be cyclical due to investors' pressure for short-term profits. "The trend before the recession was for business investment to have a smaller share of GDP. Those pressures may still be around even when the economy is back to health," he said. Figures from the OECD from 2012 show British gross fixed capital formation was 14 percent below its pre-crisis peak, while U.S. investment was 5 percent below and German investment was 5 percent higher than pre-crisis levels. But British manufacturers and the country's trade deficit may benefit from the trend in the automotive industry for car makers to source more parts locally, avoiding the risks of long international supply chains and hedging on currencies. This drove Toyota's decision to buy fuel pipes from the UK factories of Japanese parts maker Futaba Industrial. "Toyota were quite insistent on producing it in the UK. A lot of large businesses want to localize production back into the UK to mitigate currency risk," Paul Heard, Futaba's UK managing director, said. Only a third of the parts in a British-built cars are made in Britain, compared with half elsewhere. Improving this could add 3 billion pounds to economic output, making attracting foreign parts makers a government priority. Mike Matthews, European managing director for another Japanese parts firm, Nifco, said generous government grants in England "made a huge difference". However, there is still a danger that consumer demand could falter before investment and exports take up the slack. Euro zone demand from remains weak. High energy costs and skill shortages are challenges and there is the risk that Britain could leave the European Union - something firms such as Ford are campaigning against.